This 2D and 3D cad software is one of the most cost effective, easy to use CAD Solutions on the market today. VectorWorks is cross platform. It works on both Windows and Macintosh computers and the files are interchangeable. VectorWorks offers speed, power, ease of use at an uncommonly low price. VectorWorks reads and writes DXF, DWG and other commonly used CAD files. The VectorWorks interface can be set up to hide functions that you never use making the program look as simple as any CAD program could be. Easy to use and value for money! 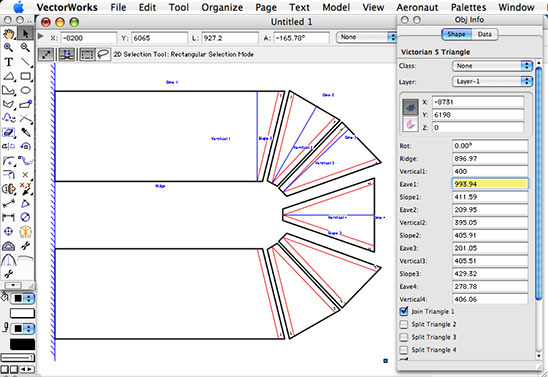 Vectorworks interfaces perfectly with Aeronaut’s Tangent nesting and cutter driving software. VectorWorks has powerful and high end features such as attached spreadsheets, bills of materials, 3D surface modelling, walk-throughs and macros. Other CAD programs have some of these features but very few have all of them. VectorWorks is also very popular. Like many popular Windows programs such as Word and Excel, Vectorworks started life on the Macintosh platform before it was moved over to Windows. It is overwhelmingly the market leader in the Mac environment and in the UK and Japan VectorWorks is the single most popular architectural program on any platform. The Power of plug-in tools. VectorWorks also contains its own scripting language Vectorscript, that allows VectorWorks to be very easily programmed. This might be something as simple as a quick routine simplifying repetitive tasks that you string together yourself, or it may be a complete and powerful plug-in tool for rapid pattern development. Aeronaut have a growing library of plug-in tools for Vectorworks. At the time of writing these include simple tools for adding seams, developing shade sails or processing DXF files, to complete solutions for swimming pool liners, cardboard boxes, truck side curtains, flattening 3D shapes into 2D patterns or developing complex conservatory blinds. Most plug-in tools are parametric. 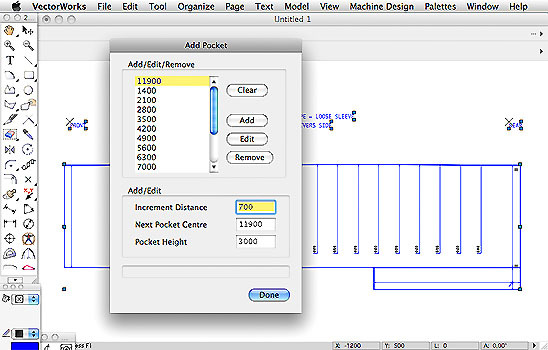 That means you enter a few simple measurements and a complex pattern is generated in a flash, ready to cut. Plug-in tools allow you to have industry specific software for a fraction of the cost of developing a program from scratch. That’s the real power of plug-in tools. Quick, cheap to develop, and very powerful. You can download pdf files on various Aeronaut developed plug-in tools from the downloads section of this site. If you need something special developed for your needs contact us. For comprehensive details about Vectorworks and demo software, please go to the Nemetschek website at http://www.nemetschek.net.